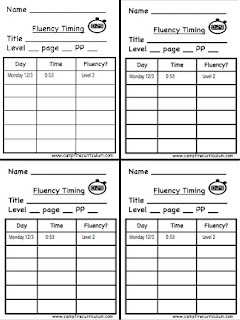 You can read any professional text to find ways to teach fluency! BUT when you have a room full of "robot readers" that is easier said than done. 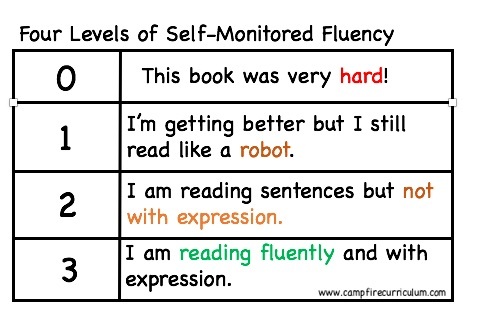 My goal was to find ways to create confident, fluent, and expressive readers that have taken the mission of being fluent into their own hands! Not all of the ideas I tried to implement failed. 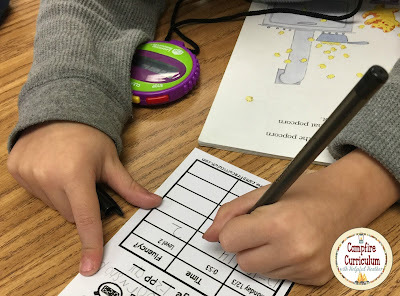 There were many ideas that I now use to build up fluency knowledge. With some students teaching them how to see words in groups (of three or four words) instead of being overwhelmed by a paragraph has worked. I actually hear some of my students say, "I lock it in my brain and let it out my mouth." before they read. This idea of scooping three to four words (we call it 'scoop and say'), reading them, and then saying them has worked...... but something was still missing. Of course we must model fluency for students. It only takes a few seconds to show students how new readers sound (reading word by word) and then model reading fluently. Tell students that everyone starts reading word by word but with practice they can read with fluency and expression (just like teachers). 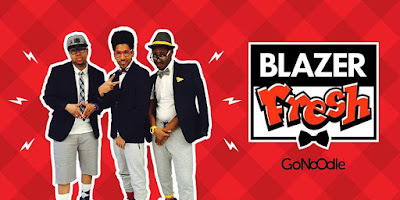 Recently, Go Noodle added a new 'channel' called Blazer Fresh! This group of three young men are amazing! My students love them and so do I. Please check out this video called Don't Read Like A Robot. 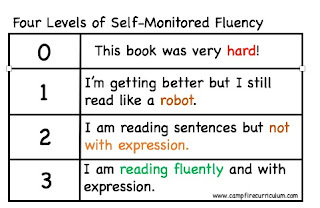 If you play this for your students they will realize that reading like a robot is not an insult but a normal step in reading. 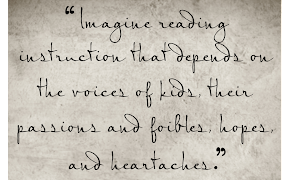 They will also have a goal to read like they are speaking to a friend. These young men sing in their song, "flip a switch and read like this". I have had students actually say that to each other during partner reading. It's cute because the students giggle and then read with more expression and fluency! I've implemented some fun ideas and the kids enjoy them in small group. Using fluency sentences is a good way to start. All that is needed is sentence strips and markers. Make sure that you are using high frequency words in the sentences for each level. You can color code the strips and mark them with numbers on back so that they don't get mixed in with other sentences...... and they WILL get mixed in together! This activity is great for multiple reasons. Students have to search for a capital letter to begin their sentence. Students have to find punctuation to end the sentence. Students need to read the words over and over to see if the sentence makes sense. 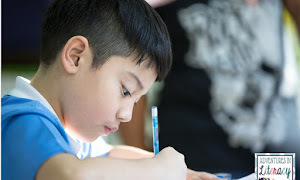 Once the student has put the sentence together you can how the student that when new readers read their words sound disconnected (pushing each word apart). 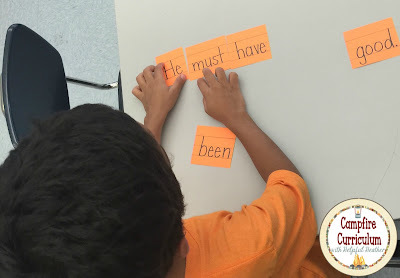 Then push the words together showing students that fluent readers read smoothly (the words are connected). 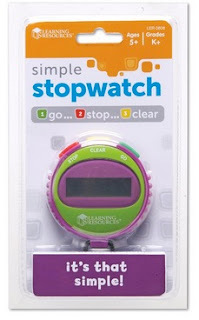 I would recommend this timer (stopwatch) for everyone especially those who have readers in need of developing fluency! These wonderful timers can be found on Amazon for under $8 a piece! First let me tell you why I think they are superior to other timers. They are simple to use! Students can easily manipulate them. They do NOT make any noise. There is a long lanyard to prevent dropping. Students are motivated to read with fluency! I like to use the timers in small group reading. Right after my students complete a feature sort they take out their most recent book (they will use this one book for the week). They take out their "Fluency Timing" record, grab a timer, and start recording. I keep my timers (I have 6) in a small pencil box. I also keep pens and record sheets in the box. Since I have purchased these timers, my students have never forgotten to practice fluency! 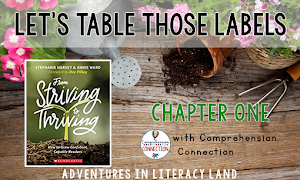 You will need to teach them to write the title of the book, level of the book, page they will be reading, and which paragraphs (if needed - most of the time I have the students read the entire page and write "all"). 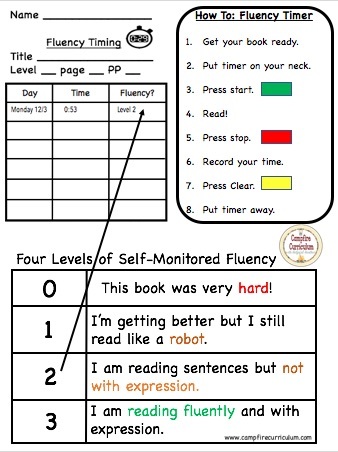 We choose a new fluency passage/book on Mondays and turn in record sheet on Fridays. To make it easy, I have made a guide sheet that I keep on the table. 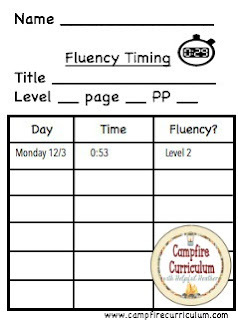 The guide shows students what they should write on their "Fluency Timing" sheet, how to use the timer, and the four levels of fluency. I chose to use four levels for my class. We regularly discuss that we may not move to a higher level everyday but that we will eventually move up! I also use these for my confident and WAY TOO FAST readers. 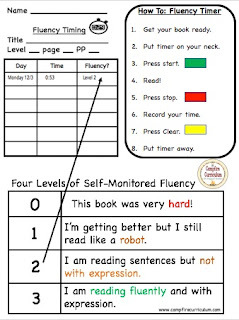 A good way to start is by modeling the process for my fast and robot readers. I will start the timer and read fluently (and with expression). I show the students my time on the timer. That approximate time is their goal time. I will record that time and keep it in on my own recording sheet. I don't want them being hung up on a certain time but I also want to show them that they are getting closer to a goal time. 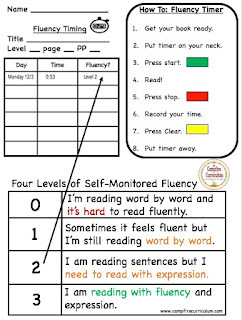 These can be laminated and set in the area of fluency training. 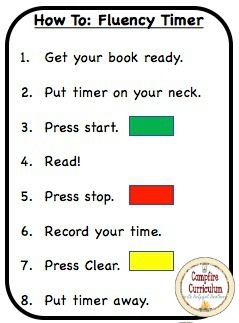 The students can use them to guide them as they fill out their recording sheets and how to use the timer. The wording on the levels of monitoring are different on each one of these guides. I found that my students responded easier to the guide on the left. 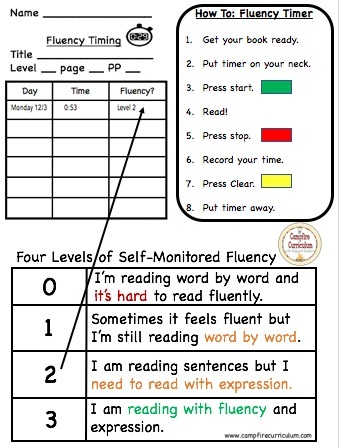 This is the recording sheet that I use to monitor fluency. You are welcome to use it too! 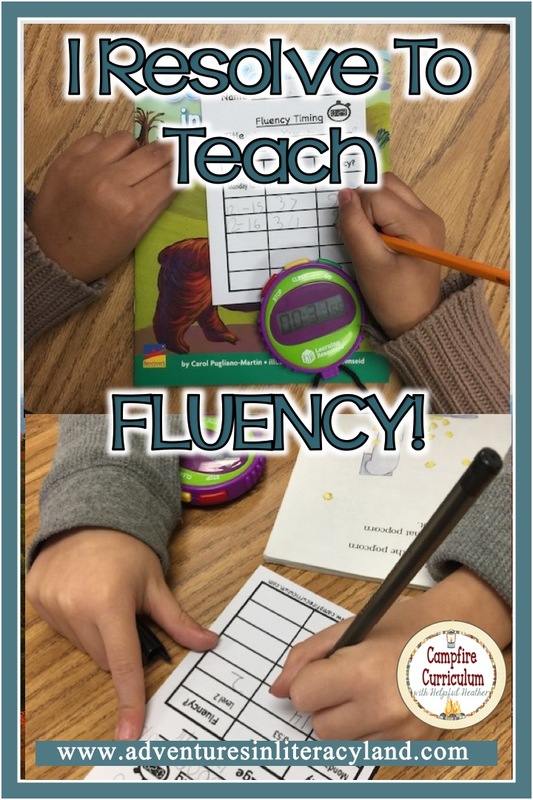 What are your tricks to teaching fluency? The fluency timer has made a wonderful difference in my classroom. 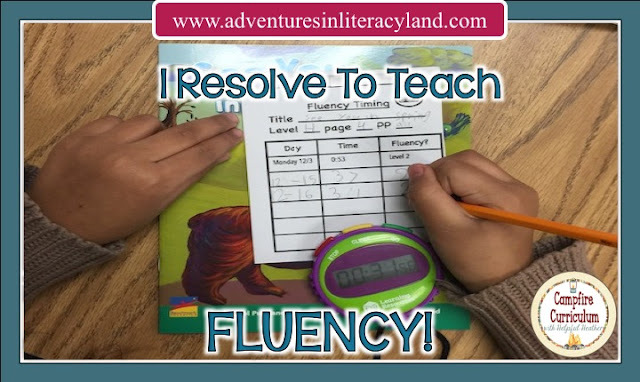 There are so many wonderful ways to teach fluency and I want to hear from you. Please let me know what works in your classroom. I'd love for you to share your resource wins and goals for your students. Have a wonderful 2017!!! Happy New Year!